August | 2013 | Chics Take Flight! Thank you everyone who attended Chics Take Flight 2013 (especially those of you who persevered through Google Maps’ incorrect location information of the Innisfail Airport! Central Alberta Gliding Club has already contacted Google about revising the listing for the airport.) Although drop-in traffic declined from last year, we saw a whopping 70% increase in paid flights, and any event where we can get more people in the air is a success in my books. Chief Flight Instructor John M. expressed satisfaction yesterday evening with the safety of the event as well – no small accomplishment given how busy the airspace was. We had the Stearman biplane, 4 gliders, 2 towplanes, a jump plane, and dozens of skydivers per hour all sharing the same area and using runways just feet apart. Thanks to the professionalism and skill of all the pilots, we observed no conflicts. 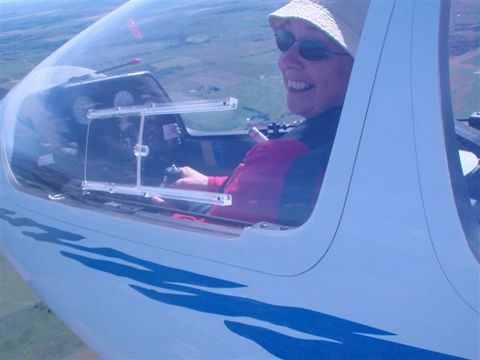 Thanks again to attendees, vendors, sponsors, and of course volunteers – Chics Take Flight is becoming a major event in the Alberta soaring world, and it wouldn’t be possible without all of you. Stay tuned for event photos soon. Chics Take Flight 2013 is a GO for August 10! The rain is not predicted to arrive until the evening, but the building clouds in the afternoon is actually just the kind of weather that can make for longer soaring flight. So arrive early to get your name on the list! Besides, this is Alberta and we’re pretty sure the forecast will change between now and tomorrow anyway. Last year’s Chics Take Flight started out cloudy and raining the night before, but the day was bright blue sunny skies. We fully expect this year’s weather to follow suit! 1) If you want to email us, you will have to do so directly, from your own email account, until I can install a more secure form. In order to avoid further attracting bots, I won’t write out the full email address here, but it’s a Gmail address, and the name before the “at” symbol is “chicstakeflight”. 2) Many of you have tried to contact us using the form and have not received a reply. We’re really sorry about this! We should have been checking the spam filter all along. I’ve alerted the rest of the Chics organizing committee to this problem. We’re going to go through the spam folder right away and pull out all the emails that appear legitimate. However, Gmail automatically deletes spam after 30 days, so if you emailed us before Canada Day and didn’t hear from us, your original email is gone. Could you kindly email us again, directly this time, so that we won’t lose your contact information in the junk folder? Thanks! The SPAM skit, of course!